Fifa 08 is the first football game from EA to grace the Sony PS3, and thankfully there have been enough changes to make this a different beast to play, when comparing it to last years version. 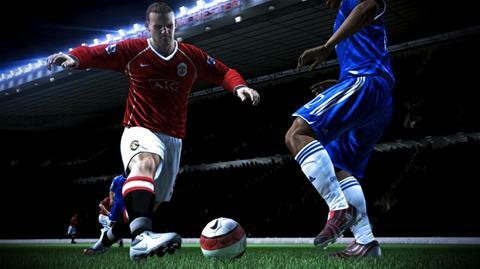 There has been a variety of new skill tweaks, which if the time is taken to master them all, then the player will win a lot more matches than their rival. The game features the usual rounds of tournaments from the major leagues, which can be played both on and off line. There is a a practice mode which allows you and three other friends to get down and dirty straight away, which also has ranked and unranked versions when played online. There is however one new feature which i personally found quite interesting, where the player (you) can only play one player out of the team in each match. It is as if you have become that particular player, and are involved in making passes and kicks as you would for real, when being passed the ball by your fellow team mates. Sometimes this can be boring, such as the times when you defend and hardly see the ball at all during a match, but it does add an element to the game that has not been done before. This version is also a lot more difficult than previous versions, and any player expecting to pick up and play this straight away, will be in for a slight shock. Due to the new skill moves incorporated into the game, it now requires a lot more skill to tackle other players and keep the ball. Due to this the matches are a lot slower paced, and makes you work a lot harder to maintain possession or even score. This gives the game a more realistic feel to it, and will make more hardened Fifa fans sit up and take note. This version of Fifa is still being played by us here at PS3pad.com. As stated above, it is a lot more realistic and the matches will take you longer to become victorious. Due to this the game feels better value for money. The graphics are first rate, and players and stadia are instantly recognised. The overall feel is just better value for money. Previous story PS3 more developer friendly?